Jenny Pride from Pymble has been giving disadvantaged children a loving home on the North Shore for over 25 years, which is why Claudine Townsley from Wahroonga has entered her in the North Shore Mums Mother’s Day Competition to find the North Shore’s most inspiring mum of 2016! I would like to nominate the awesome Jenny Pride as North Shore Mum’s most inspiring mum of the year. Jenny was introduced to me through mutual friends at North Shore Helping Hands as a local leader in the Foster Care Community around the North Shore. She is a sprightly 72 years old and has been forever busy giving disadvantaged children a loving home on the North Shore for over 25 years. Over this time she has cared for well over 27 foster children and currently she is caring for a tiny baby, who was placed in her care at only five days old. Jenny will care for the baby until it is time for her to move to her forever home. Many of the foster children that have made a home at Jenny’s have had moderate to severe disabilities. Fortunately, Jenny began her vocational life as a nurse, which provided her with the specialist skills that many of the children whom have been entrusted into her care, have desperately needed, in addition to a loving, accepting environment, which Jenny readily provides. Jenny also made good use of her nursing skills during volunteer work at refugee camps in Myanmar, Laos and Sri-Lanka. Supporting people facing adversity and disadvantage has been very close to Jenny’s heart throughout her life and she takes every opportunity to support and assist those around her. She does it quietly, without any expectation of recognition for her work. During her volunteer work overseas, Jenny met many families whom were in the process of adopting children for very disadvantaged backgrounds. It was through these connections that Jenny met Marusha. Marusha is now 19 and met Jenny when she was 5. Marusha was previously adopted by a couple in rural Australia, from India. When Marusha found herself once again in need of a loving family, Jenny was there for her. When the adoption broke down, Jenny took Marusha into her home, where she has remained happily ever since. 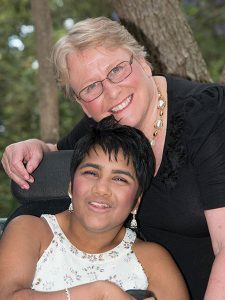 Marusha has Cerebral Palsy and still lives with Jenny and through Jenny’s determination, love and support, Marusha lives a full life and works five different jobs!! Jenny’s endeavours to help others are unceasing. Just a few weeks ago, Marusha and Jenny appeared on TV together in relation to their support of an Australian start-up that aims to provide aids to people with disabilities, at a fraction of the usual cost. 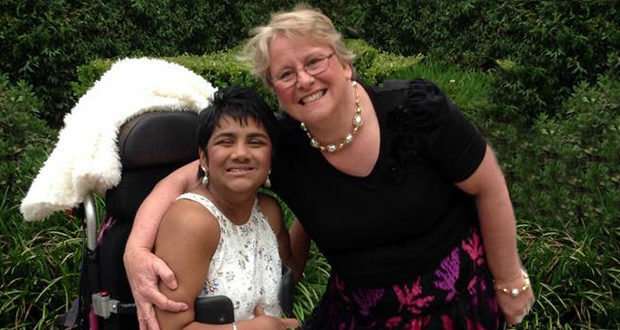 Jenny and Marusha had designed an aid that fits onto the control on Marusha’s wheelchair. It fits around the way that Marusha’s hand works and she is able to control her wheelchair without assistance. Their hope is do provide similar devices to other people. Jenny has also raised her own family and finds time to support a network of foster carers, mainly on the North Shore, who all care for children with disabilities. She is has the drive and stamina of a young Mum in her 20’s combined with the wisdom & experience of a lady who has lived a life of caring first for others. She is truly an incredible woman. Her love for the greater community is always apparent when she will drop everything to ensure the safety and comfort of a child. Many young children will arrive at her doorstep in the middle of the night, having been separated from their family or carer in what could be described as troubling circumstances with nothing else to accompany them. Some are just wearing nappies. Most kids won’t even arrive with their favourite toy or teddy bear. She is definitely deserving of ‘North Shore’s most inspiring mum’ title! Jenny likes to work the background is not one for fanfare so only hopes to win so that she can share anything she wins with her network of other families in the area. When I asked her why she does all of this, she simply said because she can. If she can help, she will. I would like to take this opportunity to say a huge thank you to Jenny for helping out other, less fortunate Mums, the foster children on the North Shore and people with disabilities. Nominations have now closed. Voting for the North Shore Mums most inspiring mum opens Friday 6 May. Next Story → Vote for your favourite Inspiring North Shore Mum!